If you are wondering what actually is Viber for PC or is it different from that which is available for Smartphones. Ending up all your queries, Viber is similar to the application which is available for Smartphones, which helps in making free Video calls from you Smartphone itself. This application in not officially out for PC’s, but with the help of Android emulator you can install Viber on your PC. We are here with a detailed tutorial on how you can port Viber to a Windows based PC or Laptop using Java and Android Emulators. You can make free calls to all other Viber users worldwide. You can also make free International Calling. You can send free Text messages to all other Viber users worldwide or on any device. You would be able to Invite your friends who are not using Viber for talking/ texting for free. The Viber app for PC/ Laptop similar to that of Viber app which is works on Android Smartphones. No bugs reported in the app until now. Viber will only work on your PC/ laptop if you have some additional softwares on your PC/ Laptop. It requires Android emulator and Android emulator in turn requires Java to be installed on your PC. So, firstly install Java on your PC. Java can be downloaded for free on your PC from Oracle’s website for Java. We have discussed about Windows PC only but rest assured it will work on Mac OS also. Step 1: First of all, go to Java’s website. Step 2: Now, click on “Java download”. Step 3: The “Java.exe” application we be installed on your PC. Step 4: Soon Java will be working on your PC. Now, you should install Android emulator on your PC in order to install Viber for Android on it and then you’ll use Viber for Android as if it’s Viber for computer. Register for a Viber account using your computer and then log into Viber from your Viber for PC/ Laptop. Now, you will be able to make free calls from your PC/ Laptop. 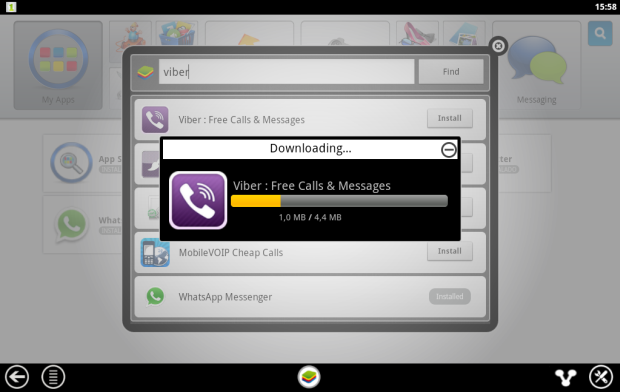 Step 1: Now, that you have Java and Android Emulator on your PC, download Viber for Android on your PC/ Laptop. Step 2: Just install Viber app on your PC (Emulator). Step 4: Lastly, activate your Viber for computer app. Cool! By you would have been able to make free calls from your PC using Viber. Share with us if you have any issue, we deal with the same. Update: Viber can now be directly downloaded on Windows, Mac or Linux PC. You will not need an Android emulator to use viber on your computer. Visit below Links to Download Viber for your PC.